Fall is a beautiful season, but it comes with potential driving hazards that all truckers should be aware of. The sun is setting sooner, wildlife is more active, and the weather is more unpredictable. 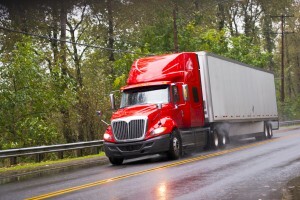 Continue reading for a few essential tips for truckers to remain safe on the road this season! As the days start getting shorter, more drivers will be on the road as the sun is lower in the sky. As the sun begins to set during rush hour traffic, vehicles are at a higher risk of accidents due to visual impairment. To avoid sun glare as much as possible, keep sunglasses in your truck at all times and keep your windshield clean. Also, since more truckers will be on the road after sunset, it is crucial to make sure all lights are in working order. Fall foliage can be a beautiful scene, but it can also quickly become a traffic hazard. Piles of leaves, especially when set, can make your tires slide and cause an accident. If you see a portion of the highway covered in leaves ahead of you, slow down- but avoid sudden braking or swerving. Fall weather is the most unpredictable, as cold mornings can turn into very sunny and warm days, while the next day you may be met with freezing rain. While truckers are equipt to handle driving in the rain, the conditions are worse during the fall season. The wind and rain cause leaves and debris on the road to become extreme hazards, as they turn very slick and dangerous. Check the weather forecast each morning, and always be prepared for various types of weather. Deer are most active in the fall, and it is not uncommon to see deer along the highway. They are primarily active during dawn and dusk, so it is crucial to be on high alert for deer while driving during this time. Pay attention to deer crossing signs, and look for deer eyeshine (while always staying focused on the road.) If you see a deer or another animal in the road, it is important not to swerve. While it is unfortunate to hit an animal, swerving is very dangerous and may cause your truck to overturn. Instead, keep your truck straight and brake while staying in control, and avoid the animal if it is safe to do so. This entry was posted on Wednesday, October 31st, 2018 at 7:54 pm	and is filed under Trucking Safety. You can follow any responses to this entry through the RSS 2.0 feed. Both comments and pings are currently closed.